I've been excited to blog about this dish ever since the night I made it. I wanted to show an example of how you can do an economical one-dish meal that still packs an incredible amount of depth and flavor. I spent about $15 putting this one together, and with 4 - 6 servings that makes it a pretty great alternative to taking your family out to eat these days. I made this with a simple brown rice couscous, which also happened to be gluten free. For an extra special treat, try serving it with Cinnamon Couscous with Golden Raisins & Mint! My best dishes come about when I've taken the time to plan out what I hope to accomplish and visualize the finished dish in my head. 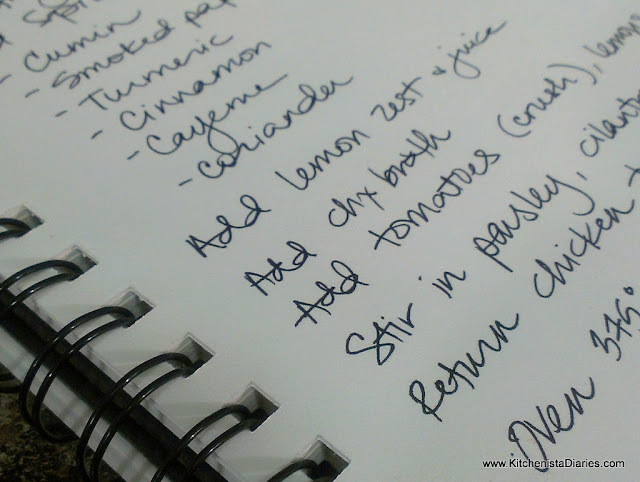 I may write down a simple list of ingredients or go as far as to draft a recipe ahead of time. It's a great idea to keep a small notebook handy in your kitchen. Use it to write reminders, jot down steps to new recipes, or whatever else will help you jog your memory when you want to recreate a successful dish. Even though I take pictures as I'm cooking my dishes, I can't tell you how many times I wished I had taken better notes. The little details are so much easier to remember when you've written them down! 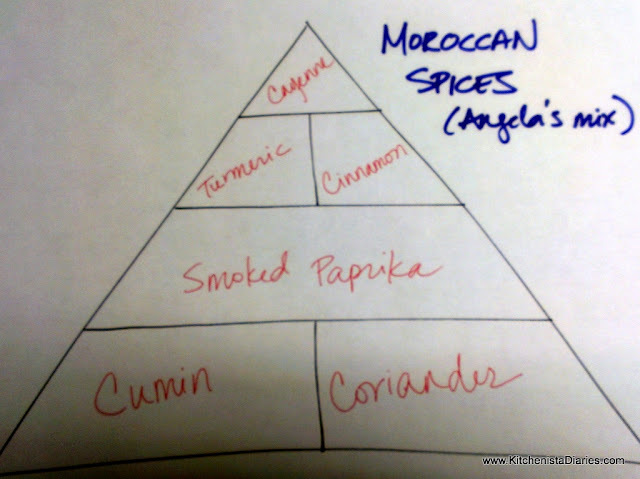 I'm a bit of a nerd, so I have a way of proportioning spice blends in my head that looks a lot like the pyramid food charts. For this dish, cumin and coriander are the first two spices that season my Moroccan sauce. Did you know coriander is the dried seeds of the cilantro plant? I love the combination of cumin and coriander together; they also make the base of many Indian curry spice blends and are great in Mexican chili. Smoked paprika is next in my pyramid and adds a nice layer of smokiness. It is rounded out by cinnamon, which adds a bit of warmth, and turmeric, which brings in an earthy hint of mustard. Finally, a little bit of cayenne adds just the right amount of heat. Make sure you are using fresh spices. If they've been in your cabinet for longer than six months, chances are they have lost much of their flavor. Often times at your grocery store you can find small pouches of spices next to the bottles. If you come across a recipe that has a spice you'd like to try but you don't want to invest in a whole bottle, just buy the smaller portion until you are ready to make use of a full supply! Chicken skillet dishes are fun to play around with, for the same reason that I like curries and stir fried dishes: it all comes down to a basic formula. Once you have the gist of some very basic techniques, you'll be able to get as creative as you want and make use of any ingredients you happen to have. For this particular dish, I wanted to highlight the Meyer lemons in season, some tasty green olives, and a rich Moroccan flavored tomato sauce. I'm going to walk you through the process of building layer upon layer of flavor, the result of which is a complex but balanced dish with crisp, tender chicken and a beautiful sauce. Let's just jump right into this, shall we? As with any dish, prep ingredients ahead of time and have them close to the skillet. 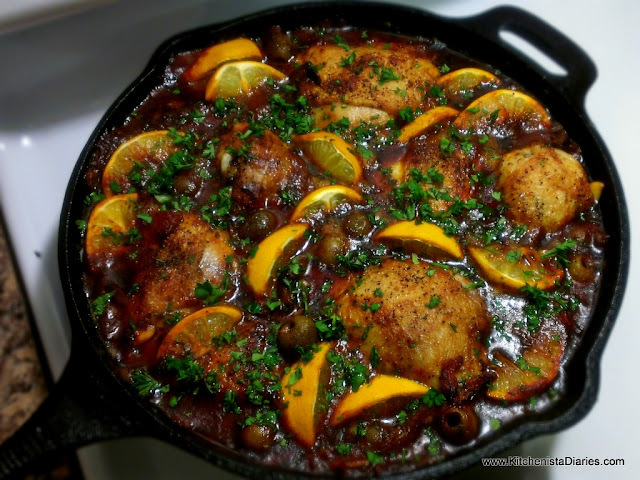 I like to use chicken quarters when making many of my chicken dishes. Besides being economical (these came in at $0.99/lb!) they stay tender and juicy throughout the cooking process. To fit better in the skillet and to ease serving, I broke my chicken quarters down into thighs and legs. Our first step is going to be browning the chicken. Pat dry and season liberally with kosher salt and black pepper. Traditionally, most people sear chicken by first dredging in four. This helps to thicken sauces and gravies. I decided to skip that step to avoid adding unnecessary carbs to my dish and to keep it gluten-free. The sauce will thicken up on its own with a little simmer time. Preheat your oven to 375°. Heat a cast iron skillet to high. With my electric stove, I can accomplish this in about 6 or 7 minutes over medium heat, but get to know what works for your stove top. When the skillet is hot, add 2 tablespoons of olive oil. This is a great example of a recipe that made me understand the obsession behind cast iron skillets. To get the perfectly seared piece of meat, you really need high heat. A heavy cast iron skillet conducts heat amazingly well, making it one of the best tools you can use in your kitchen for just that task. As a bonus, it is oven proof, so you can transfer it to the oven to finish cooking when necessary. When the oil is hot, place the chicken skin side down into the skillet. You only want to put what fits in the skillet without overcrowding, so for me that was four pieces of chicken. We will cook the rest as a second batch. You hear that sizzle? Good. That's your chicken searing against the surface of the skillet and forming a crust which will help seal in moisture and lock in flavor. Don't move it, let that chicken brown! After several minutes, your chicken will have taken on a beautiful golden brown color. That's when it's okay to turn it over to brown the flesh side for just a few minutes. When the first batch has browned, remove it from the skillet, transferring to a dish off to the side. Continue cooking the next batch(es) until all of your chicken is browned and set aside. You should have a couple tbsp of fat in the skillet; if you have excess grease just drain some of it off before continuing. If you don't have enough, add olive oil to the skillet. Do you see all those browned bits at the bottom of the skillet? That's a ton of flavor and a great base to any sauce, as you'll see now. Toss in the sweet onions to the skillet. If you haven't noticed by now, I almost always use sweet onions - either the white or red varieties. I love their mild flavor as they don't overpower my dishes. They're also really easy to caramelize! Saute the onions in your skillet until they have softened and started to brown. Add garlic slices and minced ginger, otherwise known as aromatics. Continue to saute until fragrant. Get these initial steps down, and you're well on your way to making an awesome curry or stir fry dish too! Now we're going to season the onions. I start with my cumin and coriander. I provided you some approximations in the recipe above, but season as you wish. You may decide you want more or less flavor; you also will need to adjust seasoning to your likening depending on the onions, tomatoes and other ingredients you've used. Next is a good bit of smoked paprika, the turmeric and cinnamon, and finally the cayenne pepper, all of which will bring a lot of depth to our sauce. Stir that up real nicely, continuing to cook the onions. The spices are going to bloom as they warm in the hot oil. Add a splash of olive oil if your skillet is too dry. Next, add the juice and zest of two Meyer lemons. You can use regular lemons for this dish if that's all you can find; you may want to accommodate with a little extra honey later on, as Meyer lemons are significantly sweeter than what you're used to in common lemons. We're using some heavy spices to make a rich tomato sauce, so the citrus brightens it up quite a bit. I'm adding it in two ways - to the base of my sauce, and later with whole lemon wedges cooked with the chicken pieces. As you stir the lemon juice into the onions, it will start to lift up any browned bits at the bottom of the skillet. This is good, because all that flavor becomes the base of our sauce. Add in a couple cups of unsalted chicken stock. Notice, there hasn't been a need for any salt yet in making the dish. You can get the best control of sodium content by waiting until your sauce has thickened before salting. That way, when the sauce reduces, it won't be saltier than you expected. Add tomatoes. Fresh would have been awesome, but this time of year can be difficult. 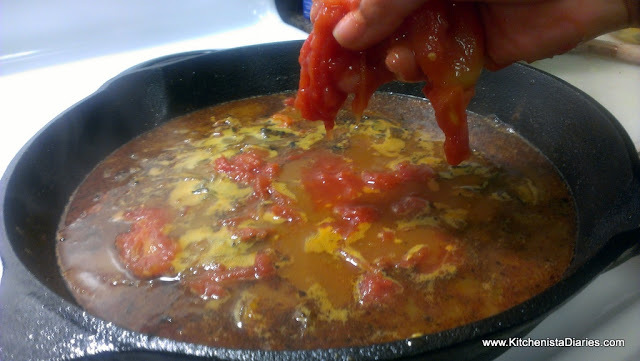 These Italian whole peeled tomatoes work great in a pinch. Just crush them with your hands into the skillet. Stir and let the sauce simmer over medium heat. Cooking takes time, great sauces being no exception. If you give a sauce time to simmer naturally, it will intensify in flavor and reduce down on its own, becoming thicker without the use of flours or cornstarch. After 20 minutes or so, my sauce had thickened up nicely. Give it a good couple pinches of kosher salt, some black pepper, then stir and taste it. Keep in mind we will be adding olives later, which will add some saltiness. Adjust seasonings as desired. I added a tablespoon of honey to bring out the sweetness a bit more. Stir in the green olives. Green olives add a delicious brininess to the sauce, and are a classic ingredient in Moroccan dishes. If I can't find good fresh olives available or want to try something milder, I recommend Lindsay's Green-Ripe Medium-Pitted Olives. My son will devour these, whereas sometimes the strong flavor of other olives turns him off. 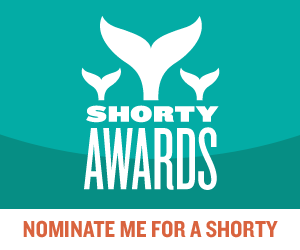 They have a nice buttery flavor and are packed only in water and sea salt. When you have to buy canned foods, read labels and always go with brands that use little to no preservatives. Always rinse and drain canned foods before adding to your dishes. Next, stir in about half of the cilantro and parsley. Both herbs will add a freshness to our sauce. Next return the browned chicken to the skillet. Leave the tops of the chicken exposed so that it can continue to crisp when it's in the oven. Finally, place Meyer lemon wedges in between the chicken pieces. Because the rind of Meyer lemons is super thin, the entire lemon is edible, especially after cooking. Turn off the heat and carefully transfer the skillet to the oven preheated to 375°. Cook until the sauce is bubbly and chicken is golden brown and cooked through, approximately 15 to 20 minutes. It's always a good idea to use a meat thermometer to check whether chicken is done. It should reach 165° at the thickest part of the thigh when cooked, so taking the skillet out of the oven at 160° will be fine as it will continue to cook in the hot sauce. If you don't have a meat thermometer, make a small slit in the chicken with your knife. Juices should run clear. Top with remaining cilantro and parsley to finish. Trust me, this thing is beautiful. You will have amazed yourself if it's the first time you've ever made this sort of thing. While my chicken was roasting in the oven, I whipped up a quick batch of organic brown rice couscous. First time trying it, and I thought it was okay. It had a nice nuttiness to it and the texture was a lot like rice. It's a great option if you're looking to go gluten-free. Personally, I'm going to stick with my Israeli couscous but this was a fun and nutritious alternative! I cooked my couscous using the remaining chicken stock I had, and stirred in some lemon juice and kosher salt once it was done. Easy breezy. 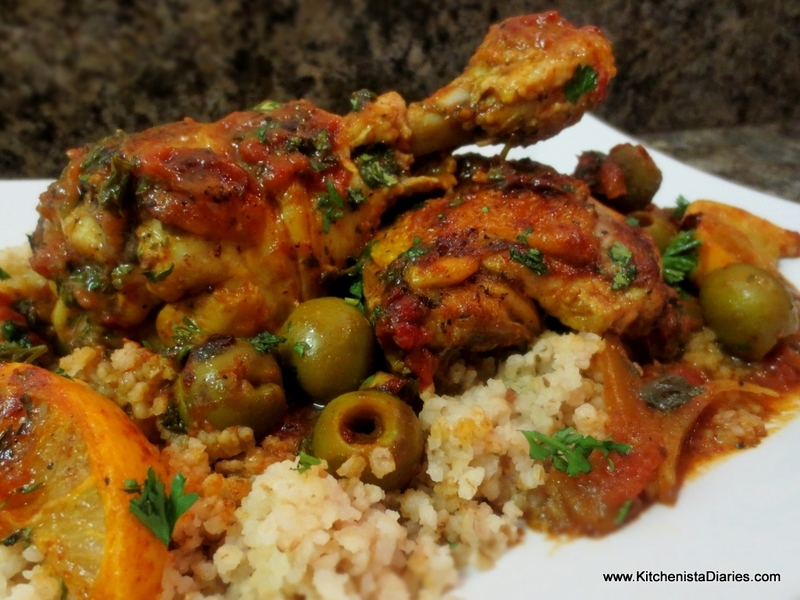 Serve chicken pieces over couscous with olives and lemon wedges to garnish. 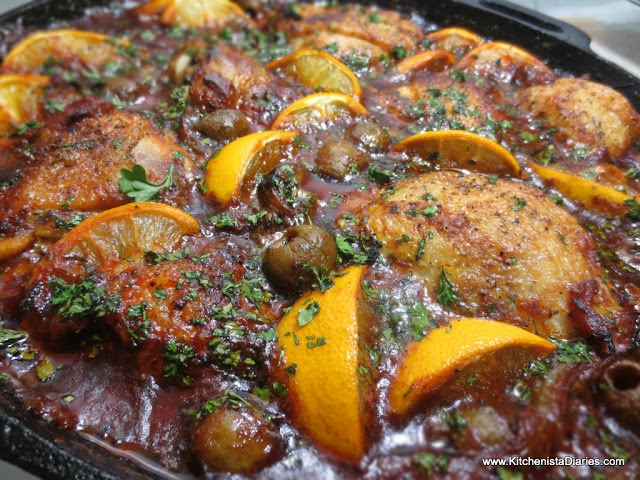 Fragrant, flavorful, tender chicken with bursts of citrus and olives...it's a Moroccan party in a skillet! 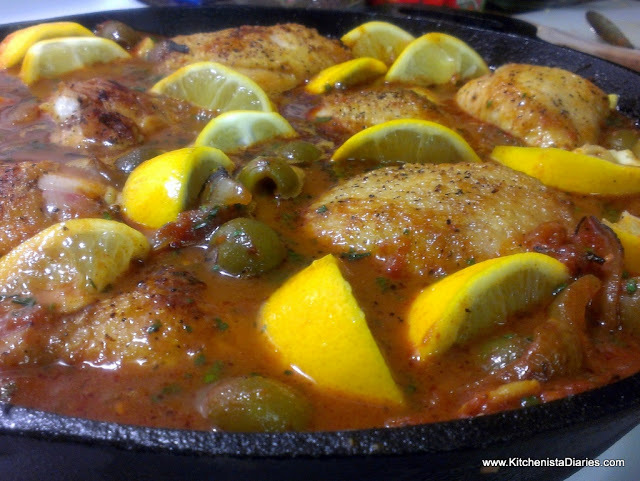 I do hope you enjoy this one and have picked up a few tips to use in your own skillet dishes! This looks really delicious! Moroccan foods are full of all sorts of awesome! This looks fantastic, I'm coming over.